Born in Bridgeport, CT December 28th 1984, Paul Pontillo (Sinergyst)was influenced by the hip hop industry from an early age. Growing up as the Hip Hop genre was building its empire. He began writing poetry at an early age for school projects and every essay that he completed had rhymes that supported a storyline. At the age of 14 he realized his passion and talents as he put them to use by writing songs. At the age of 16 he began incorporating the written lyrics with instrumentals. His first song ever created was “The Night Life”. The songs they created were very catchy and fun which soon developed into something bigger. After the creation of “the struggle” Sinergyst was very busy and hard at work. He met a wonderful girl, Ashley, and together they brought a beautiful little girl, Kiersten, into this world. Paul realized that as his intensity for music grew that he would have to brand his image. Simple being known by Paul was not going to cut it. He knew that he wanted to stand apart from the cliché antics and stand for something bigger. With this he thought about what he contributed with his musicality. The answer was simple as he realized with every word written and vocal spit he produced Synergy. Therefore Sinergyst was his name, and not one that he chose but one that has chosen him. With life moving fast and times getting tougher he said “All the more reason to step it up” (Sinergyst, 2009) as he developed the backbones to Fortified Records, LLC in 2009. With the help of the Daniel Dube, Chris Pristas, and Matt Mcguirk, the independent Record Label was born. Recording in the studio with his friends, working at the office, and performing at venues have transitioned him into a professional recording artist. Sinergyst and Fortified Records went hard at work producing over 30 new songs for his debut album "The Catalyst", one of which is “The New Chapter”, and "In The Zone" Ft. Multi Platinum Artists Bizzy Bone, and Jae Millz from YMCM (planned to be the album’s single). This hit single generated a spark and buzz on the street and various websites including Myspace, Facebook, Soundclick, Tweetmysong, and Reverbnation. Highest position in SoundClick charts: # 1188 (1,544,937 songs currently listed in HipHop). The buzz surrounding Sinergyst is now becoming a roar! 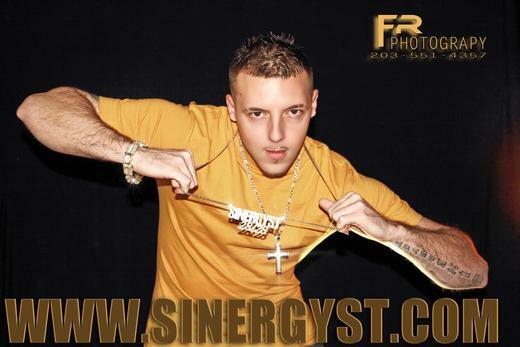 Sinergyst released his debut album "The Catalyst" in Sept 2010 by Fortified Records, LLC and through J Distribution. "The Catalyst" is for sale in over 70 Best Buy locations and ONLINE EVERYWHERE! Adding to this, Sinergyst has performed at many venues in the Tri State Area including Toads Place, The Webster Hall, MGM, The Warehouse, Night Clubs, Bars and many more local events. There is a tour in the works for 2013-2014 which will be called the "Rise Of The Sinners Tour" . Sinergyst has been featured on Magazines, Ezines, Radio Stations, Internet and Commercial, Local TV, and Blogs all around the world. Sinergyst Has released 4 Mixtapes up to date including "The Struggle", "Life of a Sinner Vol1", "Rise of The Sinners", and "A Sinners Playground"
His Singles Include "Ride Tonight", "Law of Attraction Ft. Devon Brooke", and "King Me"
Sinergyst has debuted his latest video "King Me" on MTV JAMS and is currently on the MTV Website. With the fresh new vocals and storylines behind the songs Sinergyst will have no problem joining the ranks of the hip hop industry.